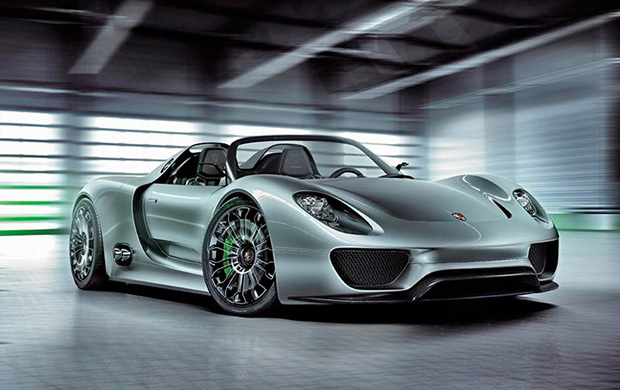 Lunching in five months time the new Porsche 918 Spyder is being tested to its limits right now by Porsche Engineers. With nearly one million miles under their belt the car is currently in the Valley of Fire outside of Las Vegas, Nevada being put through its paces. Powered by a hybrid 500bhp 4.6 liter V8 engine and with electric motors on the front and rear axel providing another 218bhp, the 918 Spyder can see 0-62mph in under 3.2 seconds and reach an ‘eyebrow raising’ top speed of 198mph. A pretty impressive lap time of 7:30 minutes around the Nürburgring racetrack in Germany, faster even than the Porsche Carrera GT mean this high performance concept sports car will be one hell of a game changer for Porsche. Like the McLaren P1 you can drive the 918 on the electric motors alone. A button on the steering wheel allows the driver to choose among four different running modes: The E-Drive mode is for running the car under electric power only, with a range of up to 16 miles and with a top speed of around 93 mph. The Sport Hybrid mode uses both drive systems, but with the focus on performance. Most of the drive power goes to the rear wheels, with Torque Vectoring serving to additionally improve the car’s driving dynamics. Expect prices to start at around $1 million when they into production.